WTA2000L-ST A2000 11 3/4 inch Baseball Glove Wilson WTA2000 L-ST Baseball Glove, Right Hand Throw, 11.75", NEW* Retail $299.99 This year's Wilson A2000 series is simply the best ever. 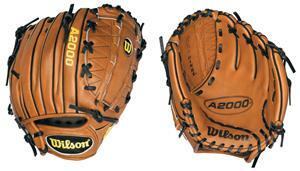 Since its introduction in 1957, the Wilson A2000 has set the standard for premium ball gloves. The A2000 gloves are made from American Pro Stock Steer hide that is hand selected for its rugged durability. A2000 series gloves also offer the new Dri-Lex technology. This Dri-Lex technology is an ultra-breathable wrist lining that transfers moisture away from the skin, keeping your hand cool and dry. A2000 series gloves also feature the patented Dual Welting system that offers a pre-curved finger design that helps maintain a stable and durable pocket. The Dual Welting technology is a patented design used exclusively by Wilson in the United States. Super Skin Technology offers twice the strength as normal leathers with half the weight and instant flexibility. All patterns are endlessly field tested and constantly improved by hundreds of professionals and top amateur players. The Wilson A2000 series gloves are unmatched in feel and offer consistent performance. SKU 18861 BE Specs/Features: - Dual-Welting- Right Hand Throw - See more at: http://www.liquidationsports.com/index/page/product/product_id/12383T/category/19/category_chain/2,17,19/product_name/Wilson+WTA2000+L-ST+NEW+Baseball+Glove+%2811.75+in%29+RHT#sthash.LECyzqOZ.dpufWilson A2K 2013 OT6 12 3/4 inch baseball glove for a left handed thrower.